FIRST, we had Beth Yahp with The Crocodile Fury (1992) and Rani Manicka with The Rice Mother (2002) and Touching Earth (2004), then we had Tash Aw and Tan Twan Eng with The Harmony Silk Factory (2005) and The Gift of Rain (2007) respectively. 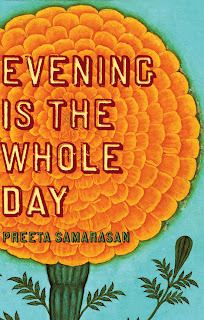 Now we have a new literary voice on the horizon: Preeta Samarasan, with her first novel, Evening Is the Whole Day (June 2008). When a rubber-plantation servant girl is dismissed for an unnamed crime from the prosperous Rajasekharan family’s home, six-year-old Aasha begins to realise that mystery shrouds the event. This is their third loss in a matter of weeks: Paati, the family’s ageing grandmother, has died under mysterious circumstances, and Uma, their golden child, has escaped to Columbia University with no plans to return. As the novel gradually moves backward in time to tell the story of the years leading up to these events, we learn how the Rajasekharan family came to occupy the Big House, and how Oxford-educated Appa, the family patriarch, courted Amma, the humble girl-next-door, and what happened to Appa’s big dreams for his family and his country. Along the way, we begin to uncover the answers to the many questions that haunt this damaged family: What was Chellam’s unforgivable crime? Why did Uma become so withdrawn in the months before she left home? How and why did Paati die? What did six-year-old Aasha see? And most pressingly for Aasha, why is Amma, her mother, so angry at Appa, her father? Circling through years of family history to arrive at the moment of Uma’s definitive departure―stranding her worshipful younger sister in a family, and a country, slowly going to pieces―Evening Is the Whole Day illuminates in heartbreaking detail the family’s layers of secrets and lies, while exposing the sordid underbelly of postcolonial Malaysia itself. Preeta Samarasan was born and raised in Malaysia and moved to the U.S. for her high-school education. She received her MFA from the University of Michigan, where an early version of this novel won the Hopwood Novel Award. She recently won the Asian American Writer’s Workshop short-story award. She lives in France. At last! I think there was a problem commenting here. Like I said in my email to you, I'll be going to Paris next weekend and if Preeta is in Paris, it'd be great if I can meet up with her. I forgot to thank you for this post! It's great of you to give me all this advance publicity -- I hope the book lives up to people's expectations now. For obvious reasons, the Malaysian audience matters more to me than other audiences. It was nice to meet you in KL and I'm sure we'll run into each other again when I'm next home. Thanks for all your good work here and elsewhere. Thanks so much for writing, Preeta. Writing is difficult and I believe you have done very well. My very best wishes on your first novel. And I hope to see you again. At Hamilton College I noted that Preeta would have made a wonderful anthropologist. However, it seems she is an even better novelist. Ahhh, well.